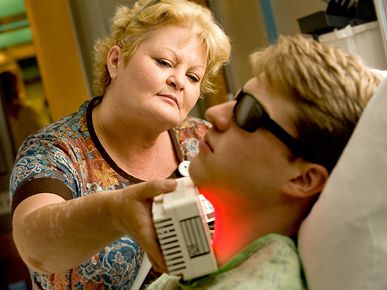 Nurse Mitzi Mackie demonstrates a device employing High Emissivity Aluminiferous Luminescent Substrate, or HEALS, on a patient at the Bone Marrow Transplant and Cellular Therapy Unit at the University of Alabama Hospital. HEALS technology was developed by NASA during space-flight experimentation on plants. Courtesy of NASA/MSFC. Photograph by David Higginbotham.